It took several minutes to read out the full charges count because they were so many rounds of different ammunition. 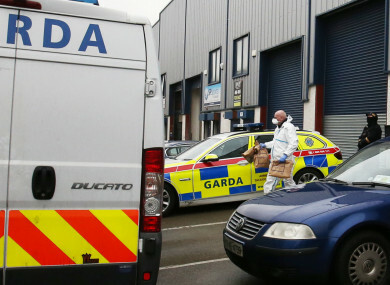 A CO KILDARE man has pleaded guilty to possessing 15 lethal firearms and more than 4,000 rounds of ammunition at a Dublin Business park two years ago. Declan Brady (52), with an address at The Park, Wolstan Abbey, Celbridge, Co Kildare was due to stand trial at the non-jury Special Criminal Court today in relation to the discovery of an arms cache at Unit 52, Block 503, Grants Drive, Greenogue Business Park, Rathcoole, Co Dublin on 24 January 2017. However, before his trial was due to commence, Brady pleaded guilty to possessing nine revolvers, four semi-automatic pistols, a sub-machine gun, an assault rifle and more than 4,000 rounds of ammunition in suspicious circumstances. When asked how he pleaded to the counts, Brady replied “guilty” in both instances. He was remanded in custody to appear before the court on 25 March next for a sentence hearing. Prosecuting counsel Fiona Murphy SC asked noted that a “nolle prosequi” would be entered on the remaining charges, which means the State will not be proceeding with these counts. Among the guns Brady pleaded guilty of possessing were two Smith & Wesson five-shot revolvers, a VZ58 assault rifle and a 9mm parabellum calibre Glock model 26 semi-automatic pistol. Email “Kildare man pleads guilty to possession of 15 guns and more than 4,000 rounds of ammunition”. Feedback on “Kildare man pleads guilty to possession of 15 guns and more than 4,000 rounds of ammunition”.